Your mortgage loan’s interest rate is determined by your credit profile, the mortgage market, and your loan type. A “good” interest rate is relative to the recent- and long-term rates. It’s important to make sure the interest rate you’re offered is acceptable to you long-term. If you can afford the additional monthly payment, you can save interest expense, pay off your mortgage earlier, and also qualify for a lower mortgage rate if you choose to get a 15-year mortgage instead of a 30-year mortgage. 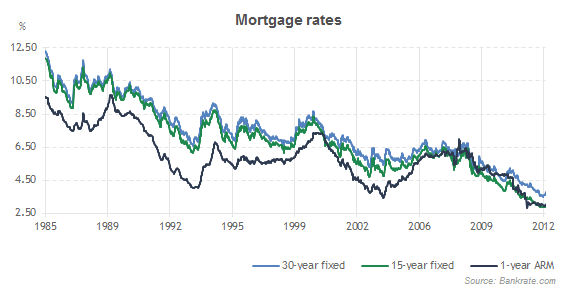 The following graph displays the history of long-term mortgage rates, for your reference.